Earlier sunsets lead to earlier evenings which lead to movie and game nights. Do you flavor your popcorn in a certain way? We love a little homemade butter with grated Parmesan cheese and a sprinkle of Italian seasoning. It’s our current favorite but it changes from time to time. Our stainless steel stove top popper is built to last. The handles stay cool. 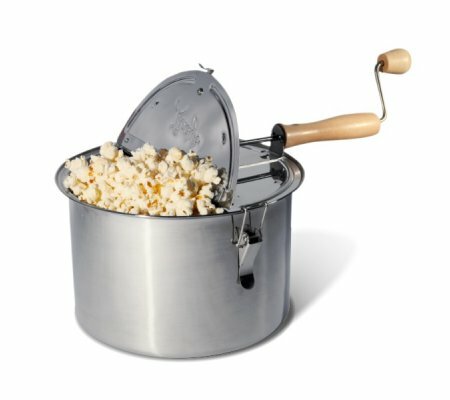 The lid vents to let steam out to keep your popcorn tender and light. Old fashioned popcorn is the best! Popping corn on the stove takes only a minute or two more than tossing a bag into the microwave. Stove top popcorn is healthy and tastes yummy, and it’s adaptable to the seasons. I’m thinking of trying one of the Pumpkin Pie spice recipes in last week’s newsletter. Pour two tablespoons of oil (coconut or olive) into the popcorn popper. Add 1/2 cup popcorn kernels to the oil. Place the popper on a burner and turn the stove on to medium to medium-high heat. Stoves vary so much that there’s no absolute setting. From the time you turn the heat on until the last kernels pop should span about three minutes. Start turning the handle as soon as you turn on the heat and don’t stop until the popping is finished. When more than six or seven seconds passes between pops your corn is done. Powdered Ranch salad dressing is a great topping. A little goes a long way so one packet will last for at least two cups of unpopped popcorn. Look through your packets of seasoning. There might be a few you can use on popcorn. Taco or Fajita seasoning are great. Try a soup mix like French Onion, but sift out the solid onions first. Cinnamon toast popcorn is an old time favorite. Mix cinnamon and sugar in a 50/50 blend and sprinkle over hot popcorn. Back when we ate chips, Salt ‘n Vinegar was a favorite, and luckily it’s easy to make Salt ‘n Vinegar popcorn. Spray malt vinegar on popcorn and sprinkle with salt. Chocolate popcorn, anyone? Melt semi-sweet or dark chocolate in a double boiler. Pour over popcorn and sprinkle with salt before the chocolate cools and sets. Once you know how to make popcorn on the stove the possibilities are endless. What kind of popcorn do you like? This entry was posted in How-To, Recipes, Uncategorized and tagged kitchen tools, recipes on October 6, 2014 by Homesteader's Supply.